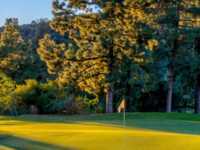 In 1959, William F. Bell, William H. Johnson and Richard Biglers par 71 course opened in Burbank, CA. DeBell Golf Clubs Kikuyu grass course is 5,633 yards from the longest tee, with a 68.8 course and 114 slope rating. The family-friendly 18-hole regulation course is hilly, with narrow fairways, and the dog legs and blind corners make it a whole lot of fun. For the less adventurous, DeBell also has a 9-hole par 3 course which is great for a quick round or a good challenge for younger golfers. DeBell Golf Club tee times are available online. When you get to the site, youll find a well-stocked clubhouse with friendly staff to help insure you have the right equipment, including golf carts, for your outing. Course marshals are on-hand to keep an eye on slower players. Carry-on food and beverages arent permitted at DeBell but the Clubhouse Grill, well-known for its garlic bread, is open seven days a week. For a special treat, visit The Castaway restaurant with its stunning view of the course and local parks in the valley below. Thanks to the great Southern California weather, Burbank tee times are available throughout the year. Reasonable fees and the unique course layout make the City of Burbank's DeBell Golf Club a good option for cheap golf in Burbank.